«Get Windows 10» GWX-icon in the system tray on the taskbar. from greed, and so much rather need to sell you their new Windows 10 PCs. and to keep your Windows 7 or 8.x untouched and working normally. If you click here, you'll download the official daownload of Total Commander Ultima Prime 5.6's missing important files in order to get the view-function (F3) to function properly. Here's the link to the official download of Total Commander Ultima Prime. Here's the link to the official download and cheap payment for the licence to Total Commander, paid to Christian Ghisler; the editor and copyright holder of the indispensable dual windowed file manager. Total Commander Ultima Prime makes it simple to keep order and sort out all the files and folders around on all the many harddisk partitions. In addition to multiple more options than just Total Commander has got. The universal free multi media player for most operating systems. and Jasc's Paint Shop Pro! Never-expiring Shareware version: The Moon Tool version 0.4 was made to run under MS-Windows 3.0, but works perfect under all versions of Windows. If you're running Win9x, Win2k, or WinNTx, and really do detest all these annoying advertising-windows popping up, that you have to use up all your energy, closing all the time, disturbing your calm surfing on the Internet, please download this small freeware program, using only 68 Kb of your memory. It will «Pow» them out like Batman did the crooks in the old days! Please install the program, and then copy the «bearcys_pow-dat.exe»-file into the \Program Files\AnalogX\POW\-folder, and rename it to «POW.DAT» (sorry for the confusion; I had to name it with an exe-extention in order to make it downloadable; it is not zipped or packed; neither is it a program file. Just rename it to POW.DAT; plain and simple!). This will give you many configurations for free. I will be updating this file from time to time, and then you may import its contence into your own; adding to your freedom. Click on the picture of the fonts (pink on blue) to the left, to download the TTF-fonts, if you haven't already got them installed. This you'll easily discover, if the fonts to the right (blue on pink) don't match their shape (please disregard eventual difference in size). They are packed in a self-unpacking ZIP-file, by the name of TTF.EXE. 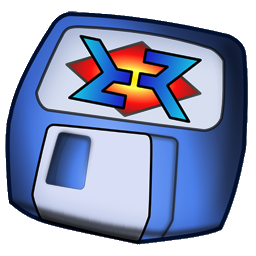 If you can't run EXE-files on your PC, please rename the file into TTF.ZIP, and unzip it in the usual manner. Install them via the Control Panel. These fonts are especially made to be easy to read on a monitor screen. Made by Microsoft for Windows and MacIntosh. Klikk på bildet av skrifttypene (rosa skrift på blå bunn) over til venstre, for å laste ned TTF-skrifttypene, dersom du ikke har dem installert fra før. Dette ser du, dersom de blå skrifttypene på rosa bunn til høyre ikke har lik form (se bort fra eventuell forskjell i størrelse). De er pakket i en selvutpakkende ZIP-fil ved navn TTF.EXE. Kan du ikke kjøre EXE-filer på din PC, omdøp filen til TTF.ZIP, og pakk ut skrifttypene på vanlig måte. Installer dem via Kontrollpanel. Disse skrifttypene er spesiallaget for god lesbarhet på skjerm. Laget av Microsoft for Windows og MacIntosh. These fonts are Microsoft Windows-fonts, and are bundled with MSIE4 (3.x + 9x + NT+MacIntosh). I use these particular fonts because they are especially made to be easy to read on a monitor screen. Just click on the font-names, and download the files. From here you can download and install free TrueType Fonts on your computer from Microsoft typography, if you want to view these pages the way they were designed. Available for Windows 3.x, 9x, NT and Apple's MacIntosh. Use to make your screen fonts more readable, if you use Windows 95 or NT (see my example of the bcyfonts-picture above). This site is best viewed with free download of (it doesn't destroy my pages like does, and is much faster to use on the web; even under Windows 98!) and a 15", a 17", or a larger monitor with 1,024x768 or higher resolution and 32,768 (32 K = 15 bits per pixel) / thousands or more colors. Does also function with most current OS's, like WinXP, and can be installed on the same partition as Win9x/ME—or any MS-DOS based OS. With System Commander Deluxe, you may also install: OS/2, Linux and all varieties of Unix for PC on the same PC, and run them side by side  whenever you feel the need to use another OS: change by restarting your PC! It does not consume a partition like other OS-shifters. You can install 4 partitions on your primary master drive; 3 Primary- and one Extended- with several Logic partitions (for Linux, OS/2, etc. ), or 4 Primary partitions (for Win 3x, Win NT 4.0, Win 95, and Win 98). System Commander Deluxe will repartition your hard drive «on the fly» without disrupting your current OS! Copyright 1995-1998 by V Communications, Inc. The absolutely easiest to use Swiss File Manager under any version of Windows. Uses two windows instead of one, like Windows Explorer and WinFile does. Resembles Norton Commander and uses same short-keys, but comes with a lot more functions than just that. Including all sorts of languages you may think of. Treats all kinds of ARJ-, CAB-, LHA-, RAR-, UC2, or ZIP-files etc. as a regular folder, and opens it in one of the windows! When it packs with PkZip, it will zip with long file names intact, and special letters like the Norwegian Æ, Ø and Å will be kept intact as well. You can also specify to keep subdirectory trees intact, and in addition to this, make self-extracting .exe-files. One of the fastest and best image-viewers on the market. One of the fastest and best image-editors on the market. Animation Shop (bundled with PaintShopPro) for animated (and/or transparent) GIFs. But you'll have to search for these, yourself! You may download some of the programs referred to above from my own homepage here. Here you may also buy space for adult stuff. while the ones below are free and awkward one way or the other. At XOOM you will not get any space for password protection or adult stuff! That makes this server perfect for Warez with a few large files (even if they claim it's not allowed), but extremely time- and work-consuming to set up for sites with many pics, like mine. I don't deal in Warez, unfortunately; only Free- and Shareware. At this server, you cannot make links to any of the pages from another site than to the first page index1.htm. This means that if you've got a site with more than 9 pages, and have got crisscrossing links between all documents, you must make a new site for each document you want to make a link to. This includes #bookmark-links. This is all free, but very time-consuming to maintain. target="_top" Specifies to load the link into the full body of the window; no frames will follow the link. If you do this between pages inside a site at Wowsites/Sexplosion, you'll only end up at the top of the first page of your site; so be sure only to insert it in links pointing to pages situated on sites on other servers. target="_self" Specifies to load the link into the same frame window the link was clicked in. target="_parent" Specifies to load the link into the immediate parent frame window of the document the link is in. target="_blank" Specifies to load the link into a new blank window; no frames will follow. This window is not named. I use "_blank" in all external links and in some picture links. At Wowsites you will not get any space for adult stuff! Come on to Sexplosion and get 10 Mb free server-space to make your own adult homepage.  Same owners and specs as Wowsites. If you need help on HTML, you may have a look at Brian Wilson's site: Index DOT Html. If you want me to insert a link to your homepage on my IT-friends page, send me your picture.  If you've just got an e-mail address, please send me your picture as an attachment through your e-mail, and I'll insert it on my IT-friends page.